1945 1945 Fiercest battle of Battle of Sugar Loaf Hill on Okinawa as Harry was a replacement for a machine gun platoon as the battle was a killing field with heavy casualties. C company went up the hill with 240 men and came back with 16 and went like this for 8 days. Watch the video as Harry explains all the stories on his amazing experiences on Sugar Loaf Hill and how his friend Bob won the Medal of Honor. 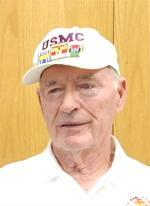 1945 Marines in World War II, joined Air National Guard in college and served 23 years at Rickenbacker Air Force Base. Went to boot camp Paris Island then to San Diego and shipped out March 9, 1945. Went to Guam, Okinawa, back to Guam, war ended then went to China for 10 months then discharged. Then came back and went to Ohio State with GI bill and joined Air National Guard for aerial photography. A Sergeant had him sweeping the floors and wandered what he got into, then General saw him and told Sergeant Lutz that a combat veteran would not be sweeping any floors so Harry was quite happy.